What a glorious day for this faith community of the Shepherd of the Valley! As your new archbishop, I could not be more overjoyed that my first visit to this part of the archdiocese is to dedicate this church, which you have built to the glory of God and for the salvation of souls in this part of God’s vineyard. You, my dear friends, are to be sincerely congratulated. You have done something wonderful here, and I hope you realize that. To realize this is the first of two churches that I will dedicate just in my first several months here brings me great joy. But this day is yours. This day is for you to celebrate what you as a community have been able to do, under the leadership of your pastor, Father Walker. You have built a beautiful church, and you and your descendants will spend many, many years worshipping and being nourished by God’s Word and the Sacraments in this church. Congratulations. I have only been here a short time, so maybe it sounds out of place for me to say this, but I am so proud of you and what you have done. I thought a good way to reflect on the meaning of this day is to reflect on the rite, the ritual that we have already begun and that will continue throughout the rest of this dedication Mass. First of all, we gathered outside the church with the doors closed as we began our celebration, and you clapped and rejoiced when I told Father Walker, “Open the doors. It is time to go in!” And we entered. As a community gathered for worship, you walked into this church for the first time. Did you notice something? None of the ministers of this Mass acknowledged the altar. We did not bow to it, genuflect to it, or kiss it; we ignored it, because it has not yet been dedicated. Right now, it is a beautifully constructed piece of marble. 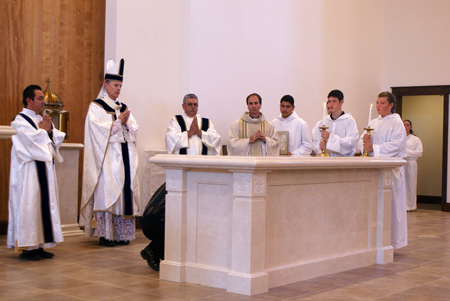 Until it is consecrated, and especially until the holy sacrifice of the Mass is offered on this altar, it is just a big slab of marble. You will see me kiss it for the first time later in the ceremony after it is solemnly dedicated. The next thing we did was bless holy water, and we sprinkled both you and the walls of this church with it. Why? First of all, to remind us of our baptism, when we became members of the Body of Christ—when we were incorporated into Christ’s saving Death and Resurrection for the first time. We are the baptized. And therefore we are the living temple of God, the living temple of the Holy Spirit. As beautiful as this church was before you came in, it is all the more beautiful now that the living temple has gathered. Yes, this house of worship is gorgeous and it is a fitting place of worship that you have raised up to the glory of God, and I do not want to take anything away from this beautiful building. But you are the real temple. You, the People of God in whom dwells the Holy Spirit. I also sprinkled the walls of this church and the soon-to-be altar because we are consecrating this building, we are dedicating this building, we are setting this building aside for one purpose—for divine worship. This building will be used for nothing else. You are not going to rent this building out as a movie theater or as a hall to have a dinner. This house belongs to God, and we dedicate it to God today. I sprinkled the walls of this church to bless it, but also to ward off all the power of evil from this place. Holy water, wherever it is sprinkled, causes Satan and his demons to flee. We want to, in a certain sense, exorcise these materials that have been used to build this church. As Pope Francis reminds us, Satan is real, and when we sprinkle ourselves or objects—including this church—with holy water, we banish him. He does not belong here. Then, of course, we heard the Word of God. What is coming next? The next thing we are going to do is call upon the saints to come, to join us, because we are part of the Communion of Saints. Some of you with a little more gray hair might remember us talking about the Communion of Saints as being composed of the Church Triumphant, those who have already gone to heaven; the Church Suffering, those in purgatory who undergo that final purification to be brought into the presence of the Lord; and the Church Militant, the “Church us,” still on this earth working out our salvation. We will join with all the saints as we invite them in prayer to come to be with us, to protect us, to intercede for us. Then I will deposit in this altar, underneath the mensa, the relic of a saint, Saint John Neumann. This is to remind us again that we are always united to the saints at the altar, but also to remind us that in the earliest days of the Church, the Church under persecution, the early Christians used to gather in the catacombs and celebrate the holy Mass over the tombs of the martyrs. We remember that solemnly two thousand years later—that we still are united to the saints; we are still connected to those first Christians. Then we will solemnly dedicate this church and this altar. I will say a solemn prayer of dedication, setting aside this house of worship for God, for listening to His Word and for celebrating His Sacraments. I will say a prayer dedicating this altar to the service of God as the place to offer sacrifice. And then I will anoint this altar. Anoint it. Just as you were anointed on the day of your baptism as a temple of the Holy Spirit, and in Confirmation you were anointed with the sacred chrism as you received the Holy Spirit. We are going to use that same oil, chrism, the Christ oil, to anoint the top of this altar, consecrating it as a place to offer sacrifice. And brothers and sisters, please be aware that we are dedicating an altar, and an altar is always a place where sacrifice is offered. Yes, the Eucharist is also a sacred banquet and in an analogous way we can speak of this as a table of the Lord from which we receive the Body and Blood of Christ, but it is always first and foremost an altar, a place where sacrifice is offered. The sacrifice that is offered here is the once-for-all sacrifice that Jesus offered on the altar of the Cross, when He gave Himself into our hands, nailed our sins to the Cross, conquered death and sin forever, and opened for us the way to eternal life. In every Mass we make present again that same sacrifice. Jesus comes to us under the appearance of bread and wine at the altar. We unite the sacrifice of our life with His here as He offers Himself in a sacramental, unbloody manner once again to the Father for our salvation. This is an altar, and a place of sacrifice. That is why it is solid. This altar is not going anywhere. It is the central focal point of our worship. It also represents Christ: that is why it will be anointed; that is why we bow to it; that is why we kiss it—because it represents Christ in our midst. It will be wholly dedicated to Him and His sacrifice. Then I will also anoint in four places the walls of the church, because this house also is to be anointed and dedicated as a place set aside for divine worship. Then, we will come back to the altar. You will see us light a flaming brazier and place incense on it. In a way that you will never see again, incense will rise from this altar. Those are your prayers rising up to Heaven. We read in the Book of Revelation that the incense rising from the church are the prayers of God’s people. When you gather and unite your prayers at this altar, they too are offered to our Heavenly Father. 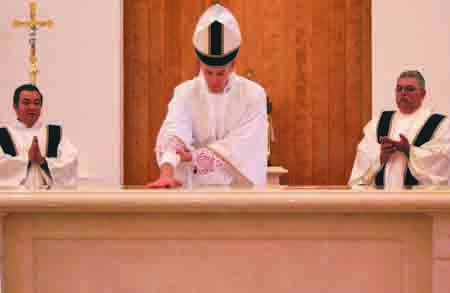 We will incense the altar itself and you in the church, to give honor and blessing. We will honor this altar now because it will have been dedicated, consecrated, and anointed to the service of Christ. Then, we will dress it, vest the altar, make it beautiful, and we will place lights at the altar. We will solemnly light the candles of this altar for the first time. That reminds us that Christ the Light is present. We light those candles also to remind us that you are the light of the world. You are the light in this community of Central Point and the surrounding area. You are called to be the light of the world, piercing the darkness that so many live in. This church must not be just for you. It must be a beacon of hope, and a light to others so that they too will come to see by your lives and by your witness the love and the mercy of Christ. Then, of course, we will offer on this altar for the first time the holy sacrifice of the Mass. Jesus Christ in His holy Eucharist will become present for us for the first time. After Holy Communion we will reserve the Blessed Sacrament—our Lord, Body, Blood, Soul and Divinity—in the tabernacle, and He will dwell with you. He will be present here in the sanctuary. He comes to live with you. This is a very important day for all of you, and I am so pleased and happy to be able to share it with you. The Most Reverend Alexander K. Sample was born in Montana in 1960, and studied at the Pontifical College Josephinum Seminary in Columbus, Ohio, before being ordained a priest for the Diocese of Marquette, Michigan, in 1990. His Excellency was ordained as Bishop of Marquette in 2006 and in 2013 was appointed the eleventh Archbishop of Portland, Oregon.